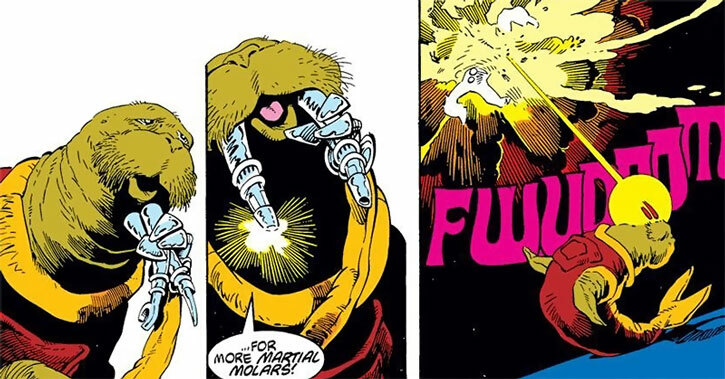 This profile is intended to be read after our Rocket Raccoon profiles. These are the ones with all the explanations and context. Group Affiliation: Partner of Rocket Raccoon and Lylla. Height: 4’2” Weight: 400 lbs. Wal is an uplifted miniature walrus of many talents. 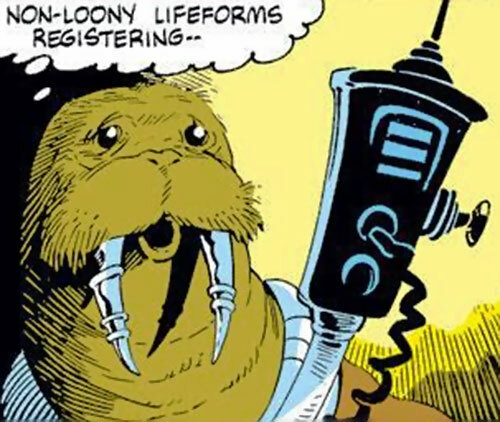 He’s a superior pilot, technician and gunwalrus, and accompanies the Ranger Rocket Raccoon in his adventure as his technical guy and sidekick. Mr. Rus has no manipulative limbs – he has the normal flippers of his phenotype. However, he always has a small bag strapped to his front chest under his mouth. From this he can deploy slender, cybernetically-controlled robotic arms. These fully replaces having hands and arms. He also uses a number of prosthetic tusks as power tools, as he finds his mouth to be a more instinctive “limb” than even the cyber-arms. Some of these tusks are laser cannons, which he can shoot quickly and with superb accuracy. Wal even knows a wide number of trick shooting routines to entertain loonies. His other entertainment skill is using his cyber-arms to perform hand puppetry shows. Wal used to pilot the Rakk ‘n’ Ruin, an intra-system aerospace ship with good sensors and durability. However, it was destroyed during the 1982 Toys War. Wal was the middle-aged uncle of Rocket’s girlfriend Lylla. He also was a good friend and ally of Rocket who assisted him in his duties as a ranger. Whenever there was trouble, he would be at Rocket’s side, often to fly their ranger rocket the Rakk ‘n’ Ruin. 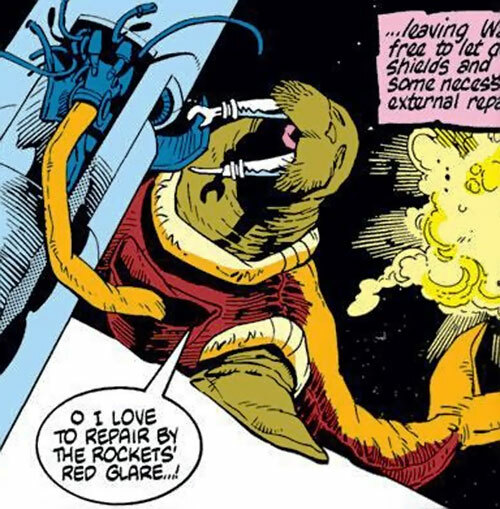 Wal was part of all known Rocket Raccoon adventures – see our entry for 1980s Rocket Raccoon. Wal Rus might have been a ranger himself, of a deputy ranger. It was never stated. In this continuity, Wal Rus was apparently just a senior technician at the Halfworld Asylum for the Criminally Insane. He appeared unexceptional. In game terms he probably had baseline Attributes and way lower Weaponry Skills. Wal Rus is much smaller than a real walrus, presumably as part of the uplift procedure. A real world male adult walrus can easily weigh more than 3,000 lbs and be 9+ feet long. Still, Wal is much heavier than most uplifts. Wal is a good-natured older guy. He acts more or less like the sheriff’s tough and principled deputy in an old Western. He’s confident in a fight, and protective of his niece. Wal likes showing off his vocabulary, using the theatrical delivery style shared by most characters in the story. In the 2010s continuity Wal is just some random technician and none too courageous. All Powers are Form Function, and Density Increase is Always On and Already Factored In. Gadgetry is limited to maintenance, repairs and power user operations. SPR (Wal doesn’t have manipulative limbs, and his body shape can be inconvenient), Dependent (Lylla – 0 pts since it’s reciprocal and they’re about as competent). CYBER ARMS [DEX 02 STR 01 BODY 01. These compensate for Wal’s lack of manipulative limbs.]. BLASTER TUSKS [BODY 02, Laser beam (optional Area of Effect 0 APs): 08]. TOOL TUSKS [BODY 02. These allow him to use his technical skills.]. Scanner [BODY 01, Life sense: 05, Limitation: Life sense specifically to detect and locate non-Human lifeforms]. Writeup completed on the 17th of February, 2014.